Daring Cardmakers May Challenge Card. I think I am just scraping under the wire with this enty. But I have the best excuse. I was distracted by my lovely visitors from the UK. Weather was fab and a great time was had catching up with all the news and enjoying a few beers in the process. I was stuck for a while to come up with an idea for this challenge and looking at all the other submissions, it seemed that all the good ideas had already been used. So I looked up Lily of the Valley on the web and found out that, amongst other things, the flower is the national emblem of Moldova! The card is based on one of the Moldovan postage stamps. I made my background by fusing the top layer of a paper napkin with a sheet of photocopier paper using clear food wrap as a bonding agent! This technique I found on another craft site (Splitcoast Stampers, I think) and I have used it quite often for christmas cards where I want something unique for my background. The postage stamp image was matted onto lime coloured cardstock, then a slightly larger piece of white and then another larger piece of dark green cardstock. The background was adhered to a white card base with the postage stamp layer on top. 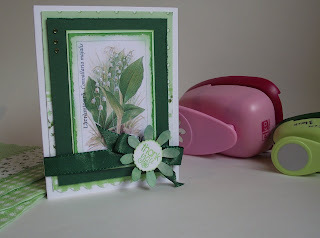 The card was finished off with a dark green ribbon and a sentiment from Stamps of Life "Thank you" mounted onto a "Make Me!" 1" scalloped circle and an "Efco" 8 Petal flower. Thanks for stopping by and I hope you like this weeks entry. P.S. In case anyone is interested, I will try to find the demontration for the Paper Napkin paper technique and post the link later. P.P.S I found a site with the 'how to' for the paper napkins on it. It is not the site I used but the method is just the same. What a beautiful card (and a lovely LO too).I love that vintage-y feel about the card, and the napkin technique sounds very interesting - not something I've tried. I didn't know that about Moldova - a good bit of research there, Angela! Your card is fabulous - thanks for joining in with Daring Cardmakers.